One of my very favourite things to do is to cast my magic foodie nerd wand and maximize the nutritional content of our food. 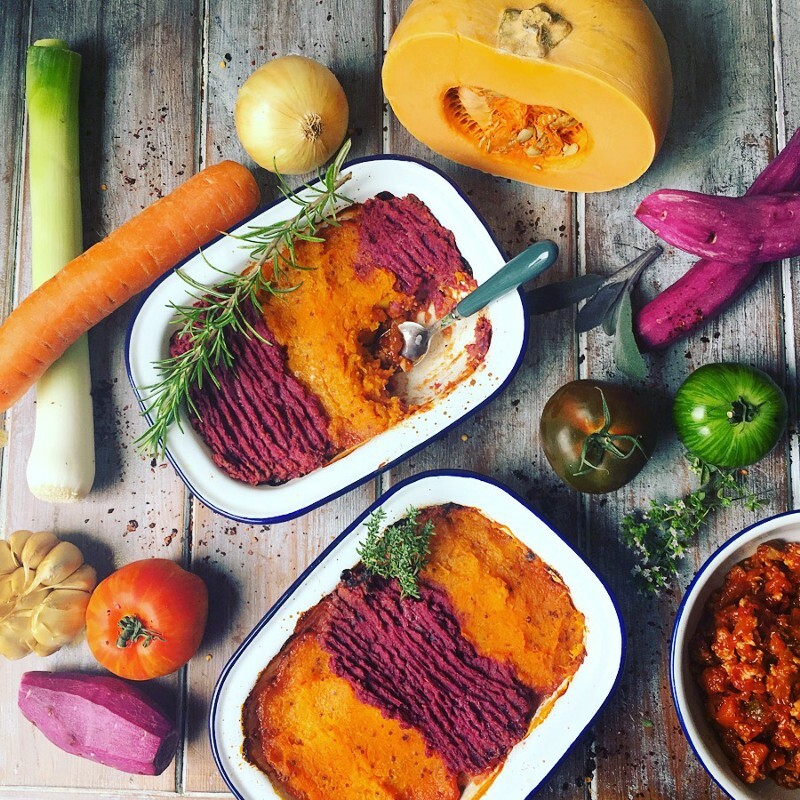 Today I turned my hand to seriously upping our Shepherds Pie game by cramming in SEVEN brightly coloured veggies. The tasty filling consists of organic chicken mince, and the topping is a mixture of purple sweet potatoes and squash. One portion provides a nourishing 504 calories, 33g of good quality protein, 35% of my daily fibre intake and an enormous 570% of my Vitamin A requirements! And it is all wrapped up in the guise of traditional comfort food. This family favourite freezes brilliantly so is perfect for the days when you need your dinner to give you a giant bear hug and tell you everything’s gonna be ok…so to speak! · Dice the onions, carrots, leeks and celery. · Heat ½ tbsp oil in a deep frying pan and sauté the vegetables until they begin to brown slightly. · Add the garlic and herbs, and sauté for another minute before adding the chicken mince. · Continue to cook that for 5 minutes. · Add the tinned tomatoes. · Add the tomato puree, balsamic vinegar, salt and pepper. Mash to get out the lumps. · Continue to simmer for another 5–10 minutes until the sauce becomes rich and flavourful. · Peel and dice the sweet potatoes and squash. · Steam for 10–15 minutes until soft. · Mash and add the butter, mustard, paprika and season with salt and pepper. · Now it is time to assemble the pie — put the mash on top of the filling and either allow it to cool and freeze it in individual portions; or else put in the oven for 30 minutes so that the filling is piping hot and the topping has started to go crispy.